At the end of 2013 our staff was made up of 77,185 people, 48.5% of whom women, compared with 79,454 in 2012. This fall by 2,269 units (-2.9%) is due to the sale of the reinsurance business of the life segment in the United States, stakes in Mexico, and the insurance businesses in Russia, Kazakhstan, Ukraine and Belarus; on a like-for-like basis, the number of employees has remained largely stable (+0.2%). With regard to the workforce, on a like-for-like basis one can see that, even in an economic context still characterised by uncertainty, stagnation and growing competition, in the last three years the Group has been able to keep its employment levels practically unchanged. 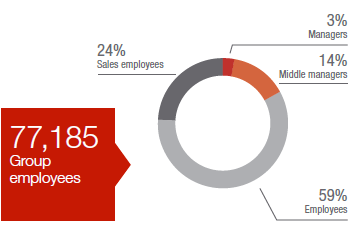 It should also be pointed out that 92.3% of the Group employees have permanent contracts. We are well aware that employment is one of the biggest problems in the major European countries in which we operate (Italy, Austria, France, Germany, the Czech Republic, Spain and Switzerland, where 63.1% of our e mployees work). In a difficult economic context, in 2013 we have managed to contain the reduction of the workforce to around 1% in this area, with stable employment levels in Italy and Spain, and moderate growth in Austria. In 2013, 95.6% of employees in the main European countries had permanent contracts. The use of temporary or project workers is very marginal and is limited to providing cover during peaks of work, one-off projects and temporary staff absences due to maternity leave, sick leave or other reasons. The contained reduction in the size of the workforce is also down to our responsible conduct in the management of reorganisation processes, such as the particularly widereaching process currently taking place in Italy. Still in the area of employment, it should be mentioned that in some countries the Group has played an active role in contributing to resolving the serious problem of youth unemployment through initiatives designed to help young adults enter the working world. On 1 July 2013 the Generalitalia Project was launched in Italy with the creation of Generali Italia S.p.A., a company in which the insurance activities carried out by the agency networks and the business generated through brokers is concentrated. Through a gradual process, this restructuring project involving over 5,200 people will be completed in 2015 when the Group will operate just through three companies (Generali, Alleanza and Genertel), which will manage the same number of brands, business areas and distribution channels. We manage the corporate restructuring operations connected with the Industrial Plan and the Generalitalia Project in accordance with the provisions of the Group union agreements in force, as well as the laws in force and the national collective bargaining contract in the insurance sector. To this end, no specific measures with regards to employees will be adopted, with the exception of definitions or redefinitions of transfers to other Group companies. The professional conversion requirements that stem from the new organisational structures are managed through training and professional retraining programmes. In Austria, some Group companies offer students of between 16 and 18 years of age the opportunity to carry out an internship at their offices. In this way they can acquire the professional experience they need so they find it easier to get work once they have completed their studies. In France, Generali France adopted the Apprenticeship Policy, pledging to permanently hire 25% of the interns that worked at the company in the 2011-2013 period. Generali signed a partnership agreement with the Second Chance School of Saint-Denis which, through a series of specific re-education and employment programmes, helps the unemployed and unqualified people who leave school early to become part of the working population. Furthermore, in 2013 it signed the Contrat de Generation, which will involve the hiring of 300 people of under 30 in the next three years. In Switzerland, the Graduate Programme offers talented young graduates of between 26 and 30 years of age the chance to carry out an 18-month training placement in the various departments and in other countries in which the Group operates. This will give them the opportunity to acquire international professional experience with a view to joining the company one day in a managerial role.